Our mission: Under the Auspices of BAMSL, to maintain and enhance the role and participation of minority practitioners as an integral part of the profession, by identifying and addressing their problems and promoting their interest, while providing a forum to address common concerns and CLE opportunities. A featured story in the February 2012 issue of the St. Louis Lawyer on civil rights trailblazer Frankie Muse Freeman, the first woman to be appointed to serve on the United States Civil Rights Commission in 1964. Click HERE to download the PDF. Co-Chair James Robinson issues a call to action for boosting support of minorities int he March 2012 issue of the St. Louis Lawyer. Read the PDF by clicking HERE. Co-Chair Nicole Colbert-Botchway shared her thoughts on "giving back" in an article found in the July 2012 issue of the St. Louis Lawyer. Click HERE to download the PDF. Jessica Mendez, Co-Chair, introduces the Minorities in the Legal Profession annual survey and discusses the importance of establishing baselines and reaffirming law firm commitments to diversity in the September 2012 issue of the St. Louis Lawyer. Read this article by clicking HERE. Attorney Samir Ramesh Mehta writes about the impact of Amendment 3, a proposed Missouri amendment to alter the Missouri Non-Partisan Court Plan, in the November 2012 issue of the St. Louis Lawyer. Download the PDF by clicking HERE. MILP announced the distribution of the Annual Diversity Survey in an article published in the February 2013 St. Louis Lawyer HERE. In the June 2013 issue of the St. Louis Lawyer, we sadly remembered our colleague Ronda Williams who passed suddenly and was active in the quest for equality and diversity. You can read about here HERE. Attorney Stephanie Hudson writes an engaging article in the September 2013 issue of the St. Louis Lawyer discussing privacy issues under HITECH and HIPAA. Read it HERE. 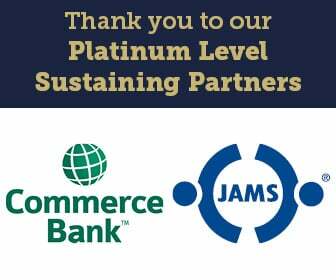 In the December 2013 issue of the St. Louis Lawyer, Martin Mathews, founder of the Mathews-Dickey Boys and Girls Club, was honored and given support through BAMSL. See the story HERE. 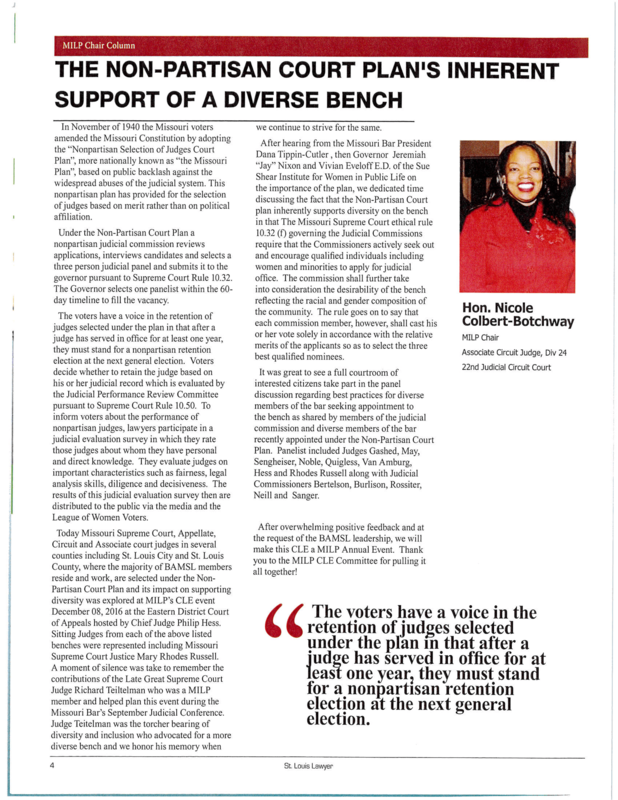 In the February 2017 issues of the St. Louis Lawyer Magazine, Nicole J. Colbert-Botchway, Chair of the MILP Section, had a featured article focusing on the Non-Partisan Court Plan. See the story HERE. 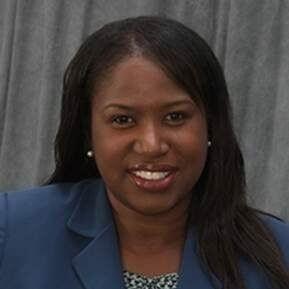 In the March 2018 issue of the Judicial Division Record, Nicole J. Colbert-Botchway, Chair of the MILP Section, wrote an article about Frankie Muse Freeman and access to courts in Missouri. Read the full story HERE.